I had a lot of trauma in the night about the unresolved injustice of my case. And I woke up with my spine hurting. I am sleeping in my friends' bed but it doesn't support the broken part of my spine very well. I have just about sorted the cat out, although she would like some peanut butter on toast as well. She is telling me so. I am going to look at castles and mines today, so that will keep me occupied. That's a spare mountain, the mountains aren't very exciting until you get to Norf Wales. I am loving the smell of the mountains, I missed it, but when I breathe in deep, these awful chest pains are worse. 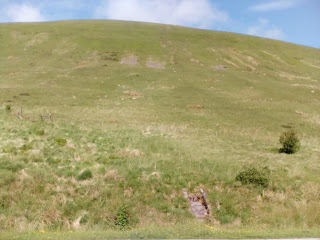 Last year I came to Wales briefly, to help someone, but I don't think I documented that on the blog, although the blog is a snapshot of the real me, to disprove the Church of England's evil vilification of me, sometimes I have discretion to leave things out, sometimes for other people's sakes.